1 bedroom, 1 full bath, elegant great room w/daybed, full kitchen, sleeps 2-4. Located in Victorian Village on historic Neil Ave. just minutes from downtown Columbus & a 15 minute drive from Port Columbus International Airport (CMH). Built in 2005, the Guest House is a dramatic loft suite in the carriage house adjacent to an 1895 Queen Anne home. The Guest House provides convenient access to the fabulous Short North Arts District, The Ohio State University, Goodale Park, the Arena District and Grandview Yard from the heart of one of Columbus' most historic neighborhoods. It is within walking distance to highly acclaimed restaurants & night clubs, numerous art galleries, specialty boutiques & antique stores. Ohio Stadium, Huntington Ball Park & Nationwide Arena are all within one mile of the Guest House. Less than two miles from downtown, the Guest House also provides convenient access to Columbus' cultural & performing arts facilities such as the Ohio, Palace, Capitol & Southern Theaters, COSI, the Columbus Museum of Art & the Wexner Center for the Visual & Performing Arts. A Note About Our Loft Style Architecture: Victorian Village Guest House features dramatic, open loft-style architecture. Please be advised that the bedroom has open walls and no doors - it is open to the great room and kitchen areas. The guest suite is at the top of a flight and a half of stairs. We regret that it is not handicap accessible, nor is it suitable for young children and toddlers. If you have an infant that is not yet crawling or you have school aged children, it may be suitable for your family. I'm a former banker who left the industry after 25 years to start my own business. I love being an entrepreneur and part of the Short North business community. Owning and operating a guesthouse has given me the opportunity to be involved with Columbus' exciting tourism and hospitality profession. As a Certified Tourism Ambassador, I love welcoming guests from near and far to our amazing neighborhood. In addition to being self-employed, I work as an art curator for a local university, where I curate six exhibitions of local artists and run an annual art auction. Being tapped in to the local art scene is a super way to be informed and introduce our guests to the Short North Arts District adjacent to the guest house. I'm a huge foodie who loves cooking, experiencing new restaurants, going to farmer's markets, home-keeping, gardening, collecting art and antiques and rescuing cats! 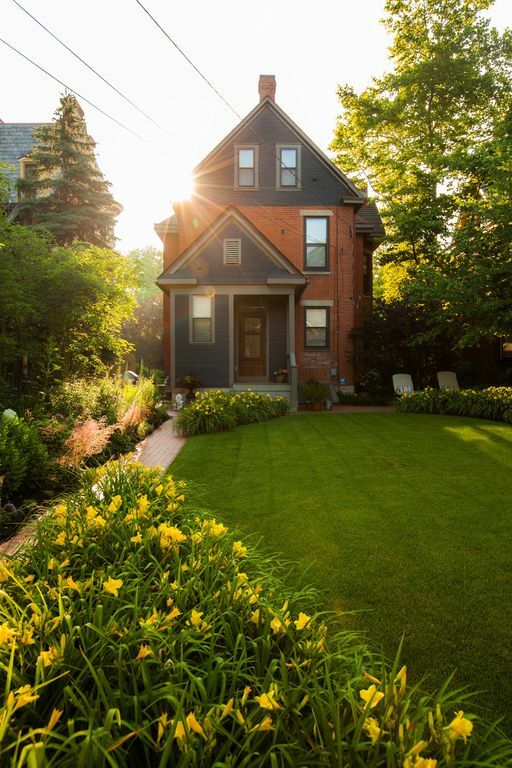 Beautifully restored historic homes, a walkable urban neighborhood and a quiet, private location are what make Victorian Village Guest House a first class destination in Columbus! Our proximity and easy access to the fabulous Short North Arts District and all major sporting and cultural arts venues will insure an enjoyable visit to the city. Or if you prefer a secluded, retreat where you can relax and recharge, the guest house will not disappoint! Fine dining, one-of-a-kind boutiques, art galleries, night life, concerts and sporting events and The Ohio State University are all within walking distance of this premier location. Victorian Village Guest House has all the benefits of a bed and breakfast and none of the downsides! As the only guests on the property, you will enjoy a luxurious, private apartment suite in a historic carriage house separate from the owner's home. The guest house's kitchen, great room, private bath and bedroom create an experience that has all the amenities of a great hotel and all the comforts of home. Guests are invited to 'live like a local' in the heart of Columbus' premier historic neighborhood. We love living in a walkable, urban neighborhood and encourage guests to enjoy the energy and diversity that only the city can offer. Whether you are visiting from out of town, are an empty nester from the suburbs who wants to try out urban living or live in the neighborhood and want to offer friends and family a unique place to stay, Victorian Village Guest House will provide guests with an exceptional travel experience! Bathroom is equipped with historic style Kohler® fixtures and an antique linen cabinet. The warm red color scheme includes decorative red and white accents, toilet accents, luxurious bath linens and exclusive spa amenities from England. We also provide bath amenities like toothbrush, toothpaste, shaving cream, mouthwash, etc. in case you forgot something! Enjoy a view of the owner's perennial gardens tucked away in this urban setting. Spacious great room including daybed, sofa, club chairs, coffee table, game/dining table, TV with cable and DVD player, stereo with AM/FM radio and CD player. Please note that the refrigerator is an under-counter bar fridge with a small freezer but no ice-maker. Coffee, assorted teas, sweeteners, cream, bottled water, orange juice, cranberry juice, Coke & Diet Coke are complimentary. Welcome amenity from award-winning local bakery also included at check-in. There is a dining table with four chairs and there is a breakfast bar with four bar stools. Guests are invited to enjoy the patio and perennial gardens on the property, weather permitting! Kayak and Canoe launch sites available within 0.5 miles of the guest house. Guest must provide own kayak/canoe. Bicycles are available to rent through CoGo, a community bike-share program located approximately 0.75 miles from the guest house. The entrance to the guest house includes a flight and a half of stairs. There are also several steps up from the street/sidewalk onto the property. Just what the doctor ordered! This was our second visit to this quaint little getaway and we couldn't have been more pleased. Lisa is such an hospitable host and full of great ideas for dining and entertainment. Short North and Goodale Park are a short walk away, if it weren't for a trip to Bexley we could have parked the car for the weekend. We'll be back! Everything you need for a great stay! I have stayed at Lisa’s place before and really looked forward to this visit. Everything was just as great as last time and we had a wonderful time! We are delighted that you so enjoyed your visit to Columbus and our guest house. We'll look forward to seeing you in October! We love staying here and have lost count of the times we have. The space is perfect for us: private, lovely back yard and patio, full kitchen, walking distance to great restaurants, WiFi, cable TV, DVD player (for my exercise videos), close to the airport, washer & dryer, and very clean. The guest house is beautifully decorated and updated with great art. The owner provides coffee and tea, laundry supplies, and fabulous French toiletries. What more could you want?! Every time we visit Ohio from California staying at Lisa’s Carraige House is a MUST! Lisa and Jeff are outstanding hosts and their accommodations are wonderful. We truly feel right at home the moment we arrive. It’s beautiful, cozy, has every comfort of home. Location is great with terrific restaurants and shopping in Short North a few blocks away. We look forward to future visits and could not recommend a better place to stay. What a perfect home away from home. The hosts are responsive, available and kind. This was the best experience. Victorian Village Guest House provides convenient access to the fabulous Short North Arts District, The Ohio State University, Goodale Park and the Arena District from the heart of one of Columbus’ most historic neighborhoods. It is within walking distance to highly acclaimed restaurants and night clubs, numerous art galleries, specialty boutiques and antique stores. Ohio Stadium, Huntington Ball Park and Nationwide Arena are will within one mile. Less than two miles from downtown, the guest house also provides convenient access to Columbus’ cultural and performing arts facilities such as the Ohio, Palace and Southern Theaters, COSI and the Columbus Museum of Art and the Wexner Center for the Performing and Visual Arts. The maximum number of guests we can accommodate is 3 to 4 people. There is a queen bed in the bedroom and a twin day bed and twin trundle bed in the great room. If you are using one or both of the twin beds in the great room, there is an additional fee of $25 per bed + tax per night. If you are a party of two, three or four people who will be using an extra bed, this additional fee applies.We do not permit guests to host any type of parties, events, business meetings or gatherings on the property. We do not allow any overnight guests other than the registered guests who are identified at the time the reservation is made. We do not do meals, catering, weddings, parties, bridal or baby showers, business meetings, photo shoots or video shoots. We have a minimum stay of two (2) nights and a maximum stay of seven (7) nights.